What Do I Mean By Tongue Posture? Tongue posture refers to the habits, motions and positions of the tongue during rest as well as activity. It refers to the tongue's default resting position while awake and asleep, and also to how it is used in activities like swallowing, chewing and talking. Why is Tongue Posture Important? Throughout this blog I have shown that my chronic migraines were triggered by compressed nerves in my neck. And I have shown that those neck nerves became compressed as a result of a lifetime of poor neck posture. In my most recent post I showed that poor neck posture itself was simply a symptom of abnormal facial growth. Thus, we must conclude that the root cause of my chronic migraines was abnormal facial development that began in my infancy. And what is the most important component of facial development? Tongue posture. Nature intends for the tongue to stimulate the soft tissue of the roof of the mouth in a very specific way. In order to achieve optimal expression of the genetic code of our facial development, the tongue must stimulate the maxilla a certain way during the 2000 swallows we perform each day, and during the 20+ hours per day of waking life and sleep in which the tongue is resting motionless in the mouth. The optimal position of our tongue during swallow and rest stimulates the soft tissue of our palate and triggers our body to deposit bone three dimensionally throughout the face, similarly to the way the body deposits bone in order to heal a bone fracture. Bone deposits build bigger jaws, cheekbones, and, critically, airways. As discussed in my prior post, those with undersized airways are in a constant state of partially choking on their own tongue. In order to facilitate breathing, the body maladapts to this struggle for air by assuming a head-forward (aka compressed neck) posture, which opens up the airway. This unhealthy neck posture damages, strains and inflames neck nerves such as the greater, lesser and third occipital nerves. In my case, this resulted in chronic migraine headaches. What is Proper Tongue Posture? Proper tongue posture is often defined as pressing the tongue onto the roof of the mouth, rather than resting it on the mouth's floor. This is the definition I ran with for 3 years as I attempted to develop proper tongue posture. This definition is basically right, but it is inadequate. It is not precise enough. There are right and wrong ways to press the tongue onto the roof of the mouth. The wrong way is to press only the tip of the tongue into the roof of the mouth. The right way is to press the whole tongue. Proper tongue posture involves pressing the anterior (front) and posterior (rear) of the tongue into the maxilla. For the first 3 years that I attempted to develop and experience proper tongue posture, I was unable to. I had a vague sense that the tongue needed to be pressed into the roof of the mouth so that it could function as a natural palate expander. And I successfully developed a habit of keeping the tip of my tongue pressed into my maxilla. But it was only in the last few weeks, after achieving 3.5-4.5mm of forward growth in my maxilla, that I was able to rest the middle and back of my tongue onto my palate and experience true proper tongue posture. 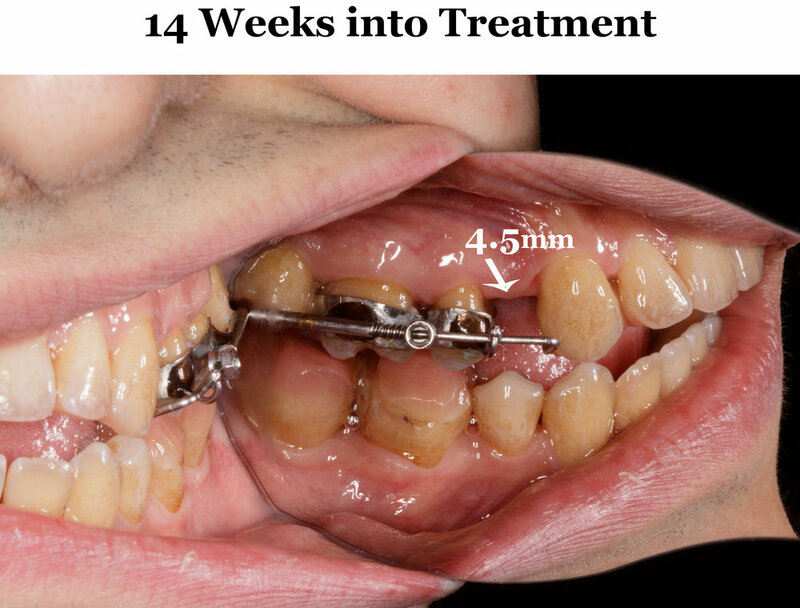 Before growing my maxilla with the Anterior Growth Guidance Appliance, consistently pressing the posterior part of my tongue into my maxilla was physiologically impossible. 1) Tongue Tie - A genetic condition in which the lingual frenum is attached too close to the tip of the tongue, keeping the tongue anchored to the floor of the mouth and preventing its full range of motion. Whatever the degree of attachment, this condition prevents the tongue from coming fully forward and up onto the roof of the mouth. More insidiously, what a tongue tie really prevents is the center and back of the tongue from coming up onto the roof of the mouth. This is why enlightened practitioners like Dr. Bronson, Dr. Leonard Kundel, DMD, and orofacial myofunctional therapist Kathy Winslow classify this condition not just as tongue-tie, but as a posterior tongue tie. Because it is the center and back of the tongue that this condition truly restricts. I cannot stress this point enough. Proper tongue posture calls for more than the tip of the tongue pressing up against what some refer to as "the Spot." It involves pressing up into the roof of the mouth with both the back and front of the tongue. 2) Underdeveloped Jaws - The second structural limitation that prevents proper tongue posture is having a mouth that is too small for the tongue. We end up with underdeveloped jaws as a result of not developing proper tongue posture during infancy. And once we end up with underdeveloped jaws, we are stuck with poor tongue posture. This is because if the maxilla is not wide enough and has not grown forward enough, there is simply not enough room in the mouth for the tongue to assume healthy posture. It's like having shoes that are too small for your feet. No matter how much you wish you could spread your toes and prop up your arch, you can't. Your foot is trapped in the prison of your undersized shoe. With undersized jaws, you may successfully press the tip of your tongue onto the roof of your mouth. But pasting the back, center and tip firmly and snugly in the palate is impossible. An undersized palate is simply too small to accommodate your entire tongue. Your efforts to press the center and back of your tongue into your palate will result in your tongue coming forward past your upper front teeth. For obvious reasons, this is not a sustainable posture. I'm writing this article now because it is only in the past two weeks that I have developed the ability to actually experience proper tongue posture for myself. I had a tongue tie release back in June 2017, and this freed up the posterior (back) part of my tongue to come up and contact the roof of my mouth. But even after my frenectomy, I could still not assume health tongue posture. My palate was too small. Pasting the posterior part of my tongue onto the roof of my mouth resulted in my tongue coming through my front teeth. 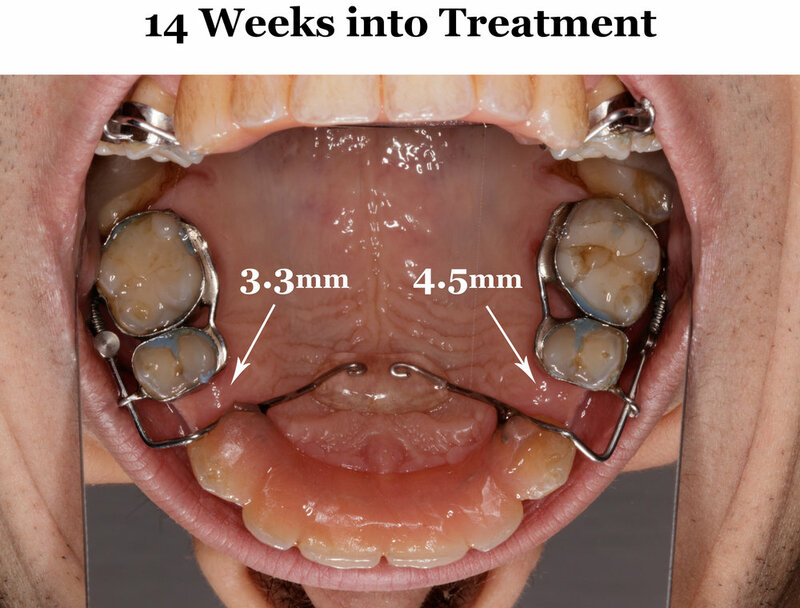 After 14 weeks growing my palate with the Anterior Growth Guidance Appliance, I achieved 3.5-4.5mm of forward maxillary growth and then, to my surprise one day last week, discovered that I could press my tongue onto my palate in a way which I had never felt before in my life. And as soon as I began experimenting with this new tongue posture, I knew I had struck gold. This was the feeling I had been seeking for years. My old method of pressing the tip of my tongue onto my palate caused my tongue to fatigue quickly. And no matter how hard I pressed, I did not feel like I was achieving an adequate and satisfying level of pressure onto the roof of my mouth. But pressing the whole of my tongue onto my palate feels so satisfying and intuitive. It sends waves of blissful, calming energy into my face, neck and gut. It removes my tongue completely out of my airway. It exerts a tremendous amount of force across the whole area of my maxilla rather effortlessly. After only a few days, this tongue posture has started becoming second nature. My body has begun holding this posture involuntarily because it is the most pleasant and satisfying position. I'm just following the bliss. What has blown me away the most about this new tongue posture is its effect on my neck posture. Of course, neck posture is an important topic across this blog. I have basically argued that my chronic migraines were triggered by compressed nerves in my neck and that these nerves became compressed as a result of a lifetime of poor neck posture. What I've discovered these past two weeks is that firmly pressing the full width of the anterior and posterior of my tongue into the roof of my mouth provides rigidity and integrity to the deep, interior muscles of my neck which are integral to my neck posture. In other words, I think that a lot of my neck's weakness is simply the result of my poor tongue posture. As long as I'm pressing the entire length and width of my tongue onto my maxilla, I don't really have to focus on maintaining the integrity of my postural neck muscles. Since 2012 I've been rebuilding my full body posture according to the principles of "primal posture" laid down by Esther Gokhale in her life changing masterpiece 8 Steps to a Pain-Free Back. After 2 years of zealous training according to her methods, I was able to internalize primal posture from my shoulders down. But no matter how hard I tried, I could not develop what Gokhale calls an "elongated neck." Could it be that all this time, the reason that I could not develop healthy neck posture is because you simply can't have good neck posture without good tongue posture? Until last week, it was possible but very challenging to hold my neck strong and rigid during neck-intensive activities like hitting the heavy bag, squatting, doing pull-ups, driving over bumps, etc. It would require me to concentrate intensely on muscles deep in the back of my neck (not sure exactly which ones, but I can feel them proprioceptively). Then I would consciously engage and elongate those muscles. Imagine someone taking the hair on the back of your neck and pulling you up toward the sky with it. That's sort of what it was like when I was holding good neck posture. It felt good and definitely protected my neck. But it was a cumbersome and unsustainable muscle engagement which I could never habituate. Holding proper tongue posture eliminates the need for me to hold this rigid neck engagement. When I paste every square millimeter of my tongue, front and back, on my palate, I can engage in all of sorts of arduous activity without feeling like my neck is flimsy. The more fully my tongue presses on the roof of my mouth, the more deep, core strength my neck has. Try it. Tongue posture has completely solved the riddle of neck posture for me. I have long known about how interconnected the tongue is with the many muscles, tendons, ligaments and bones of the face, neck and beyond. A quick glance at anatomical diagrams of all these connections is overwhelming, and I think it is beyond my ability to provide a precise physiological explanation for why this new tongue posture yields such profound integrity of the neck. I just know that it absolutely does. My body is messaging me loud and clear: "This feels good! This feels right! Do it more!" The best part is that as the Anterior Growth Guidance Appliance continues to grow my mouth bigger, giving my tongue more space to elongate and spread, this posture will become more effortless, satisfying and sustainable.